Did you know: In the United States, 40% of food is wasted while 1 in 5 children suffer from food insecurity? California produces nearly half of the nation’s fruits and vegetables, yet 1 in 7 Californians currently struggle with food insecurity. In California, 1 in 4 children face food insecurity. 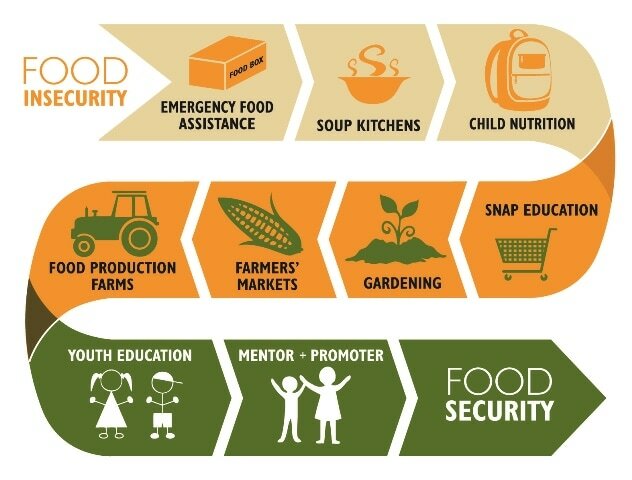 “Food insecurity” is the occasional or constant lack of access to the food one needs for a healthy, active life. In Napa County 18.6% of children live in food insecure households. This is nearly 6,000 children! Food insecurity has serious impacts on an individual’s well-being, which may result in poor school attendance and performance, lowered workplace productivity, and physical and mental health problems. Individuals struggling with food insecurity have to make tough decisions that no one should face. No family should have to decide between buying groceries or paying rent, no senior should have to choose between food and medicine, and no parent should have to skip a meal in order for their children to eat. Are you able to achieve food security and maintain your family’s health on your budget? What kinds of food choices do you have to make to be food secure on your budget? Can you achieve food security and maintain family health without using free food? Which family size was the easiest to achieve food security and maintain health? Which was the hardest? What kind of meal choices would you make for your family if you had more resources, or if food were less expensive? What feelings did you experience playing this game? Nearly a third of all working families in the U.S. struggle to pay for the basic necessities every month. For Americans working in jobs that don’t require a college degree, the struggle is more pronounced. Think about the people facing these challenges every paycheck: Americans making minimum wage working at McDonald’s, to those working multiple jobs in retail, to the sales associate at a Walmart. In this interactive game, developed by the Wealth & Poverty Desk, you can see how difficult it is to make ends meet in a low-wage job. Click on the maps below to see a relative measure of the number and variety of retail food resources, weighted by food offerings and distance.